You are here: Home / Financial Planning / What is the difference between a Fee-based and Fee ONLY Financial Advisor? Now-a-Days Media is talking a lot about Financial Investments for ex “Mutual Fund Sahi hai”, “UparkiKamaai” from ET Money, even Google have also started an Ad campaign on this on how you can use their “Search” utility to identify and get information on various Investment options. Equity Market is only for Traders or Gamblers. Not able to understand the difference between a financial product seller and an Advisor. In our Financial world we always say that “Wrong Investment Decision costs you more than not investing at all”. So, how to avoid doing this mistake? For this we have to scan on what are the offerings in the market today? Banks – They are the product sellers (cross-sell) for ex Mutual Funds , Stocks , Insurance etc. They also have Advisory services but since their earnings are from commissions from these products, their financial advice can at times are biased towards the products that they are selling. Distributors / Insurance Agents – They are also product sellers and their earnings are also totally dependent on the products they sell. Online Platforms – Most of these platforms sell “ Direct” Products which means there is no commission charged on the products, but this is more suitable for execution perspective not from an Advice perspective. In a nut shell, the market need is to get the unbiased advice with a digital platform to execute and buy those products ‘Directly’. But there are two types of SEBI RIA one is FEE Based and the other is FEE Only. A Fee Based Advisor is the one who charges annual fees based on the Assets under Management (AUM) for example, you have given 1 Crore to your financial advisor to invest , the Advisor will charge 1 to 2% per annum as his/her advisory fee. So in this case you will pay Rs 1 to 2 Lakhs as annual fee. Mostly it does not depend on the performance of your portfolio and the service engagement may have limited interactions like monthly or quarterly meeting etc. The concern here is the definition of the asset here, if for example it is all only liquid assets like Equity or Bonds, then it will be in “Interest” of the Advisor to put your assets in these instruments, which can be consider as conflict of interest. Also the advisors may service clients based on the quantum of assets for ex..they have Gold or silver members , so the “Uniformity” in providing services can be lacking in this model. The good part is that they are SEBI RIA , so they also offer direct plans and they can’t take commissions and they can only charge from clients. Mostly the Fee Format can be on hourly basis or Annual basis. Just like in Fee Based, here also interaction structure with clients can be different for each advisor. Since the Fee is flat, there can be uniformity of in service offerings for all the clients. As in Fee Based model, mostly Direct plans are offered by them and there is no conflict of interest on where to keep the assets. Some, fee only advisors just provide execution support and do not offer ‘direct plans’ also. Currently in our country both models are evolving ..as paying fee for a financial advice is still a very new concept in India. Currently Fee Based model is much followed as most of the Advisors have made the transition from being MF Distributors or Insurance Agents to Advisory, so Instead of Mutual Fund or Insurance Companies, now their clients are paying them the Fees. Fiduciary – An advisor has to follow this standard. A fiduciary is a person who holds a legal or ethical relationship of trust with one or more other parties (person or group of persons). 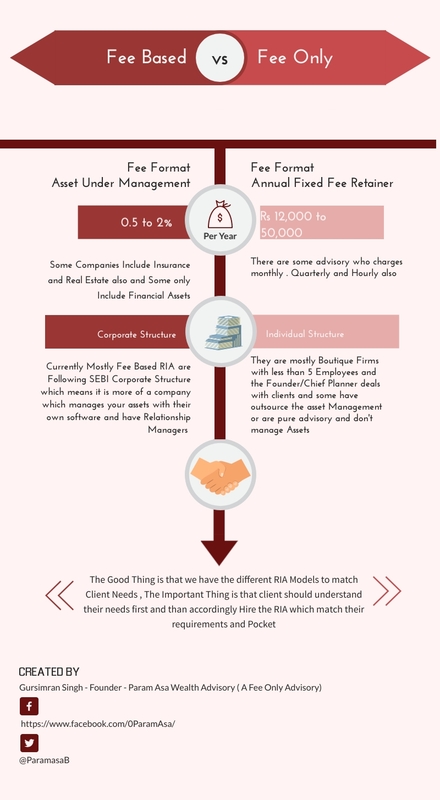 Fee Structure – They need to have transparent and well-defined fee structure. Qualification and Experience – CFP, CWM and NISM Certifications are the recognized ones, also He/She needs to have a genuine experience in comprehensive Financial Planning and Advisory and not just in selling financial Products. Clients References – Ask for references from previous clients and ask for their feedback. Touchpoints – Check for the format through which they can be contacted or check in a year how many times they will do portfolio evaluations/reviews. To conclude my point, getting a good advice is necessity nowadays..as our Investment world is becoming complicated day by day. Fee Based or Fee Only service is totally dependent on your needs. But what is important is that you need a professional help to achieve your financial goals. 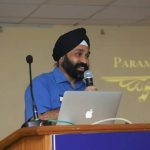 This is a guest post by Gursimran Singh of ParamAsa Wealth Advisory. Kindly note that ReLakhs.com is not associated with ParamAsa Wealth Advisory. This is a guest post and NOT a sponsored one. We have not received any monetary benefit for publishing this article. The content of this post is intended for general information / educational purposes only.